Even though I have been running for a long time, this year has been filled with revelation after revelation for me as a runner. 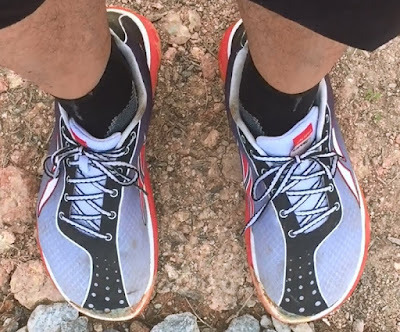 I have learned a lot about running and running shoes in particular because of my online research to find the perfect shoes for the 2XU Compression Run half marathon last month, postponed from April. I went through several phases. At first, I was into minimalist shoes after I read about barefoot or natural running. Then I got the On Cloudster and I was into cushioning. Then I got the Saucony Virrata 2 and I was into lightweight shoes. But then I had a problem with all these shoes because they were too narrow for my freakishly wide right foot. So I looked for wide shoes, which led me to the Altra The One2. They are cushioned, light and wide, but I still feel a little tightness and discomfort on my right foot. I wore the Altra for the half marathon and they performed okay until the final few kilometres when excessive perspiration caused my feet to slide forward in the shoes. All this time, I ran with socks. One day in a shoe store, I tried on the Nike Flyknit Free 3.0 without socks and it was a revelation. The shoes felt like socks themselves. I loved the feel, but the Free 3.0 were a little too minimalist for me. So I got the next best thing, the Flyknit Free 4.0. At first, I ran with socks in the Free 4.0 (in the 10k Pocari Run), but again, I had the problem with my freakishly wide right foot. So I took a chance and ran in them without socks. It worked. Without the extra fabric of a sock, I had a little more room in the shoe for my problematic right foot. I ran the Singapore Aquathlon in the Free 4.0 without socks to reduce my transition time and now I'm hooked. I'm going through my other shoes to find more candidates for sockless running, but not all shoes are suitable. They should have a seamless upper and it helps if the shoes are a bit snug to begin with. Paradoxically, I also found that running sockless helps to reduce heel slippage for shoes that are a little too big. I experiment by first walking around sockless in them before taking them for a sockless run. So far, the Viratta have passed the test. I couldn't find much information about sockless running online, although it's often discussed on triathlon forums. Apart from blisters, the most common concern for sockless runners seems to be smelly shoes. Fortunately, my nose is far enough from my feet that I don't mind.